Well those who have tasted my biltong seem to be coming back for more, which is a good and a bad sign. It’s a good sign because as I suspected, they agree is better that the shop bought stuff but it’s a bad thing because it’s still reasonably expensive to make and I am not geared up for production and I don’t have the time to make it in bulk or sell it. To this end I thought I would share my recipe so you can all start making your own. All you need is a Mellerware Biltong King that you can get from the likes of Yuppichef. As far as the choice of meat goes, I feel rump is by far the best cut. You don’t need A grade rump, B grade will do because the marinating process will also tenderise it so its saves some money. The rump should be cut into strip gutting with the grain. The thickness of the strips depends on whether you want fat or not. If you opt for lean biltong, cut the meat into strips about 1- 1.5cm . This will take around 2-3 days to dry. If you like fatty biltong, cut the meat around 2cm thick so that there is extra drying time required which gives the fat time to cure properly, probably 3-4 days. Making the biltong is really easy this makes around 4-6kg’s. Take about 100g coriander seeds and toast them. Once all the dry ingredients are well mixed, place half of each in two larger freezer bags. Place the meat in the bags one piece at a time and ensure each piece is well coated. Mix 1 cup of apple cider vinegar with 3 table spoons of Worcestershire sauce, I use Holbrooks. Add 1/2 cup of good apple cider vinegar to each bag and wait till the mix stops foaming. I like to seal my bags so that I can rub the mix around regularly. Leave to marinate for 24 hours. After 24 hours remove the meat from the bags and wash in a mix of 50% apple cider vinegar and 50% boiling water that you have allowed to cool down. 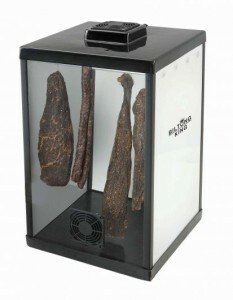 Pat the meat dry with paper kitchen towels and hang it up to dry in your biltong maker. Make sure that fly’s do not come into contact with the meat at any stage… If you find your biltong is a little too salty, you can add less salt next time.